Units representing British Army Soldiers, Royal Marine Commandos and Support Elements in Arctic, Desert (DDPM), MTP, Temperate (DPM), Tropical (DPM) and Woodland (DPM) camouflage patterns. With a large number of units and a multitude of pre-built infantry Groups to choose from, it is easy to create whole Company sized formations for your missions. Not only that, every Troop or Platoon will look unique, thanks to an automatic randomisation routine which equips each infantryman in gear suitable to his role from the wide choice of kit available. Each theme is divided into 3 factions: Army, Navy and Air Force, giving a total of 18 factions. As the Royal Marines are the Royal Navy’s amphibious troops, they are categorised under “Navy”. 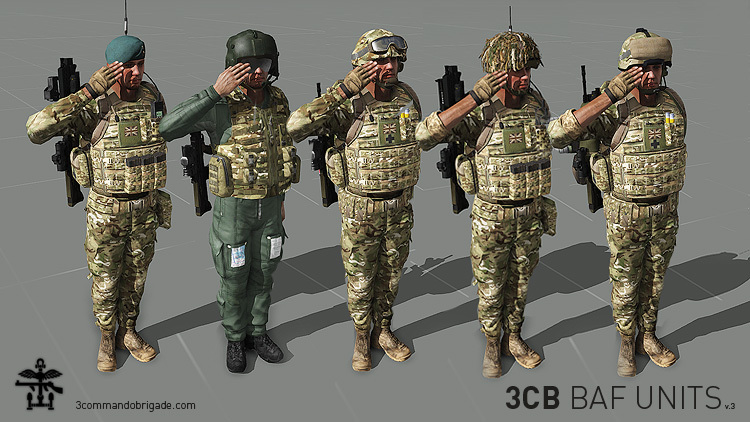 Although we at ‘3CB’ are a milsim Royal Marines Commando group, we have also provided the full range of units in generic ‘Army’ too (without Royal Marine markings) for our friends in the ArmA community to enjoy. For the MTP faction only, units are available with Bergens (backpacks) to suit the deployment type – take the light Bergens on short “Day Patrols”, or for longer yomps over multiple days, select the “Overnight” option with the heavy Bergens, which include the full kit of bedrolls, sleeping mats, entrenching tools etc. Preconfigured Groups are provided to assist mission makers with placing realistic infantry Sections on the battlefield. They come in several different configurations, representing the variety of weaponry available in the mod pack, and reflecting the often customised nature of gear found on Operations. An Editor module (‘3CB BAF Unit Configuration’) is provided for mission designers, allowing control of certain aspects of the equipment, such as whether gear randomisation is applied, what happens to gear on respawn, whether NVG’s, GPS or Fragmentation Grenades are available.